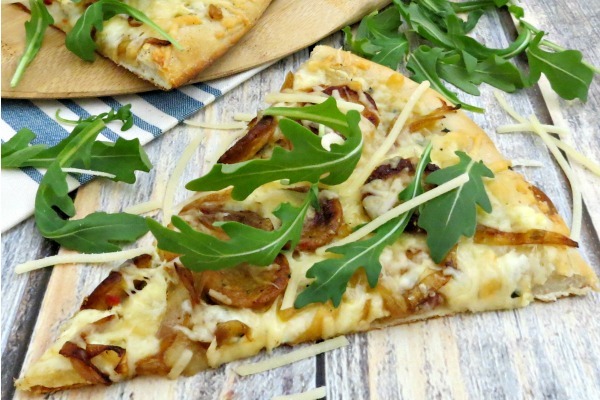 This white pizza recipe is a nice change for your typical make-at-home one. We used chicken sausage, but you can use your favorite if you like! 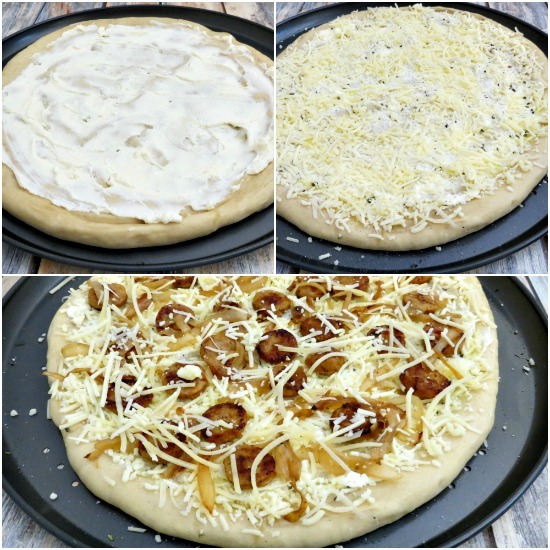 We just love making all different kinds of unique and delicious pizza in our house. Pizza is one of the few dishes in our family that everyone can agree to and is always willing to eat (we even go so far as to make breakfast pizza! )…and this one was just delicious! The ricotta, mozzarella, Parmesan, and olive oil transform into a creamy, delicious base for this white pizza. We then top it with chicken Italian sausage to keep it a little lighter, caramelized onions, and finish it with a generous handful of crisp, peppery arugula. 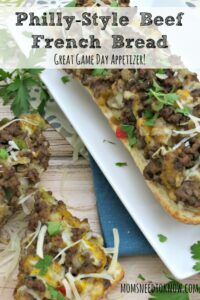 If you are in the mood for something more hearty, try my Philly-Style Beef French Bread pizzas! That being said – not everyone in my family was completely on-board with this pizza….two of my children are not fans of white pizza. No worries! We always need 2 pizzas to make a meal in our family. 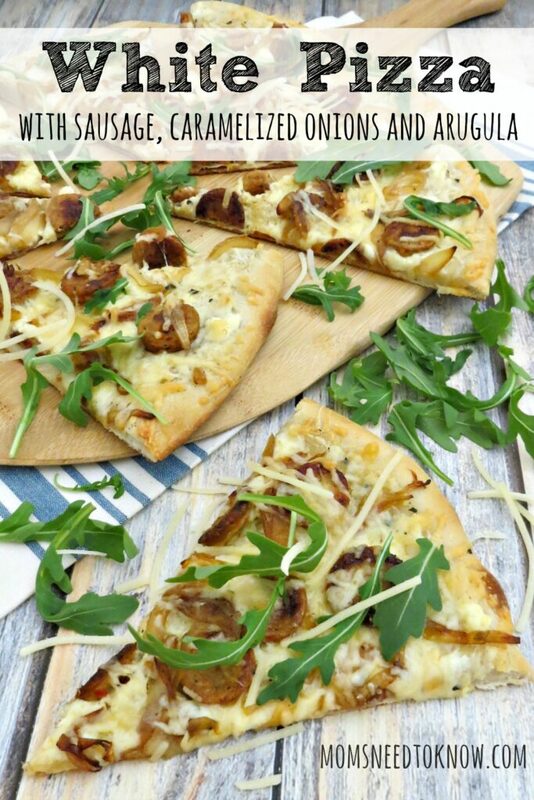 While I was making this, I let my children make some mini barbecue pizzas – everyone was happy! I always recommend using good quality ingredients in your cooking, but especially when it's something like this. When you're only using a few ingredients, you really want them to shine. Quality doesn't have to mean expensive. We buy our mozzarella from a local, family owned Italian market for $5.75 a bag. They make it in-house, it's delicious and totally worth a couple extra dollars for recipes such as this! The only thing you might need to add to this is some crushed red pepper if you like extra spice! As far as the crust….I used my own pizza dough recipe, but I recognize that not everyone always wants to make their own pizza crust. If you buy one, please at least buy a “dough ball” from the deli/prepared foods section of your supermarket – don't buy the kind of pizza dough that comes in a can! The cheeses will melt pretty quickly in this recipe, so if you are using an uncooked crust, you might want to bake it half of the way before topping it. The last thing you want it for your cheeses to start to burn before your crust is nice and crispy! Preheat the oven as directed on your pizza crust recipe or package. If using an uncooked crust, we like to bake it halfway before topping it. Add 1 tablespoon of the olive oil to a large skillet over medium-high heat. Slice the sausage into ¼" rounds and add them to the skillet. Sauté until lightly browned on both sides. Remove the sausage from the pan, and add the remaining tablespoon of olive oil along with the onions. Sauté the onions for about 5 minutes or until nicely browned and caramelized. Be sure to stir them frequently. While the onions are cooking, you can start preparing the pizza. Spread the ricotta in an even layer all over the crust. Sprinkle the ricotta with the pepper and then drizzle it with two tablespoons of olive oil. Sprinkle on one cup of the mozzarella followed by ¼ cup of the Parmesan cheese. When the onions are done and cool enough to handle, distribute them evenly on the pizza followed by the sausage. Add the remaining ½ cup of mozzarella cheese and ¼ cup Parmesan cheese to the top. Place the pizza in the oven and bake until the cheese is melted and the edges are lightly browned. When the pizza comes out of the oven, sprinkle the arugula all over the top, slice, and serve immediately. My husband and I are big on putting various or odd ingredients on our pizzas. We like mixing it up. No worries, though, we don’t like anchovies 😛 Thanks for linking up with Delicious Dishes Recipe Party! This is my kind of pizza!!! Thanks for linking up with What’s Cookin’ Wednesday!